Most students are unsettled by my “discovery” based style of teaching, at first. However, once they let go of the way they have always done math, they really enjoy it. I feel that they retain more, as my focus is never on memorizing formulas and procedures that are always quickly forgotten. Well, maybe they don’t always retain more, but they seem to understand more of what they do retain. We do use some formulas in my class, they are just not our first “go to”. Formulas are what my students develop, individually and then as a class. We only use formulas after we have investigated them, and understand them. At the end of the year it is wonderful to see how much they appreciate this and feel that they understand the math they are doing! I received a couple of lovely thank you notes from my freshmen, and other students wrote comments on my end of year survey as well. Thank you so much for giving us context in math so we fully understand where things come from. No math teachers have done that for me. Keep making us discover patterns, it helps us to think more in-depth. Understand the WHY!!! just because productive struggle isn’t always fun doesn’t mean it isn’t helpful! it makes understanding and remembering concepts easier. Thanks for a great year and challenging me to grow in this class! Last month I accidentally had a chance to “experiment” on 3 different classes of students. It reminded me of graduate school when we would devise a new method for one “test” class to try out while the “control” class was taught a more traditional lesson. It was “Swap Day” at our school. Swap Day is a half day when the 8th graders visit high school for a day. They take the place of the current 9th graders who spend their half day visiting Middle School. Since I teach primarily 9th graders, I had a day full of brand new students that I have never taught, or even met. We only had 30 minutes per class. I didn’t want to bore them to death with the, “This is what you will do in High School Geometry” next year. I also didn’t want to stand up there and talk all period to students who did not know me. So, I decided to tackle simple factoring with them, since most of them are currenlty in Algebra 1. They have not gotten to factoring yet in Algebra 1 so I had beautiful, blank factoring slates to work with! I started out with one of my most favorite factoring puzzles. It is the x-box puzzle. I give them zero instructions, just a puzzle sheet. As students start to test numbers, I walk around and let them know if they have figured out the pattern or not. This becomes a great game for them, as they all try to “get” the pattern first. The fervor usually intensifies as soon as one student figures it out. Other students redouble their efforts. Usually towards the end, students who took the longest to figure it out are the proudest and give me high fives. It’s always GREAT fun! Except for one class. I gave out the puzzle then went into the hallway to look for more 8th graders, as my class was half full. When I came back in I said, “Has anyone figured out the pattern!? !” “We ALL have.” WHAT? It had only been a few minutes. It usually takes about 10 minutes for everyone to get the pattern! Then, a student admitted, “Well, she figured out the pattern and told us all what it was.” Oh. I watched them sitting there, dutifully filling out the rest of the boxes. No excitement was born, and the rest of the class was much more flat than the ones before. Two classes had to work to figure out “the math” on their own. They had to push their brains to discover the pattern and apply it to subsequent problems to see if they were right. They were competitive with each other and themselves. They were excited and engaged. But the one class was told how to do the pattern did not get the challenge of discovering it on their own. Once they were “instructed” what to do, they mechanically filled out the tables of numbers like they would any other worksheet. I did not do this on purpose, but I am glad that it happened. Because it reminded me how important discovery and challenge is to engagement. Since I only had 30 minutes, I did not attack factoring by grouping like I usually do. I went with “number sense” and made the factoring using the boxes a “puzzle” just like the x-puzzles. I created a Factor Boxes Dry Erase Template and slipped it into a dry erase sleeve. (Everything is more entertaining with dry-erase). I gave them a couple of area models. Then I let them multiply binomials with the boxes. Then I filled the boxes in and they had to find the factors. Finally, I gave them a trinomial and they had to figure out what to put in the remaining two boxes and thus find the factors. At each stage the students caught on very quickly. And they seemed to really enjoy the challenge. I wish that I had the time to design engaging discovery lessons like this everyday. Days that are missing discovery are flat for me, and even torturously boring as a teacher. NEVER underestimate the effect on engagement of true discovery in a classroom. Calling all teachers to help me make these better! This summer at Twitter Math Camp, Glenn (@gwaddellnvhs) and Jonathan (@rawrdimus) showed us how they lead students through all of the functions in Algebra 2. Basically, they put all of the equations into (h,k) form. Fortunately, the book I am using this year, “Discovering Advanced Algebra” does basically the same thing. Since it is a “discovery” book, they have some good ideas that I have been able to modify and made into INB (Interactive Notebook) form. Never fear, this just means it’s a worksheet that you fold in half. The first discovery was also my students first introduction to graphing with Desmos on their own. Of course they have seen me use Desmos multiple times by now since Desmos has all of those great example graphs in their side bar! Here is how I progressed through discovery for linears, quadratics, square root, and absolute value. The Box files with the word docs are at the end. 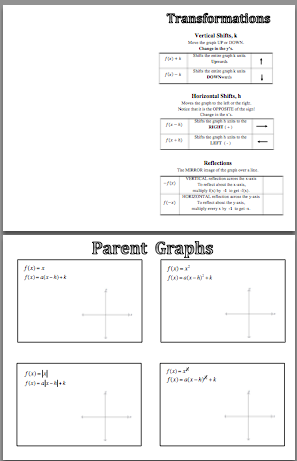 Also included is a “Transformations Parent Graph” foldable that I made to sum it up. I kind of hate this one, and would love suggestions here for sure! Should I add dilations? Why is it so ugly? What else do I need to add? I need help here for sure. Please note: I did not make all of these discoveries from “scratch”. I created some of them. 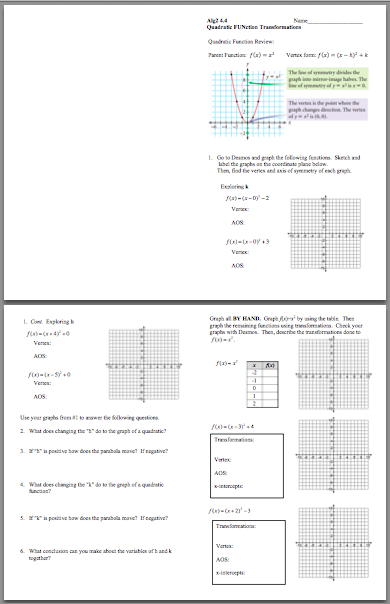 But some were inspired by the textbook I am using this year, “Discovering Advanced Algebra” and some were created by my amazing co-teacher. 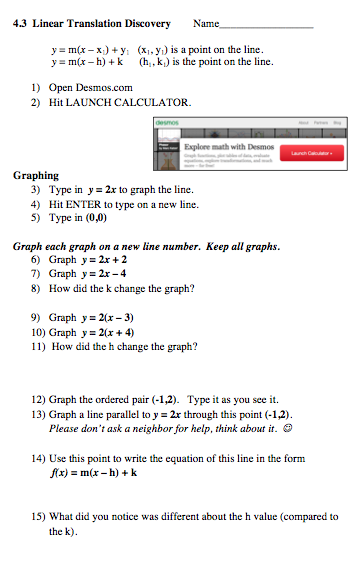 I then adapted all of them for INB (Interactive Notebook) form.